Canada will face the U.S. and Cuba in group play in the top tier of the inaugural CONCACAF Nations League. The Canadian men will have to win the group if they are to reach the semifinals of the tournament that covers North and Central America and the Caribbean. The group stage will be played in the FIFA international match windows in September, October and November 2019. Canada will play home and away matches with the Cubans and Americans. The tournament championship is scheduled for March 2020. While exact dates have yet to be announced, U.S. Soccer said Canada will open play with two games against Cuba in September with the Americans playing their matches in the October and November windows. But a Canadian Soccer Association official disputed that, saying CONCACAF had not yet provided any scheduling details. Canada coach John Herdman welcomed the League A tests. "It's an important time for Canada to get two matches against U.S.A., which on top of being derby matches they provide us with the chance to test ourselves, to learn and to develop against the reigning CONCACAF champions," Herdman said in a statement. "We also get to face Cuba and we know that they will give us a tough test, home and away, but particularly the away leg will test the resolve and resilience of this team." Canada has not beaten the U.S. since 1990, when it won 1-0 in Burnaby, B.C. The Canadian men have gone 0-9-6 since. Canada has defeated Cuba in three straight matches, holding a career 6-2-3 edge. 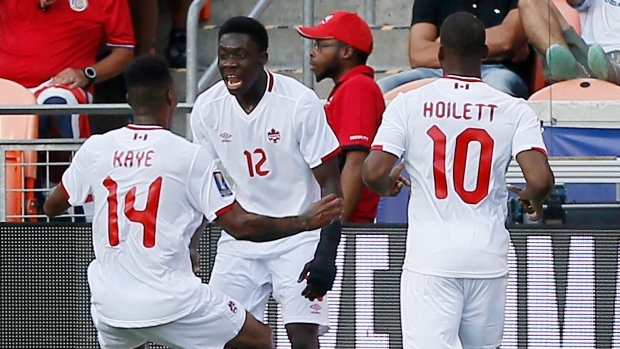 Canada finished second, behind Haiti on a tiebreaker, in the 34-team CONCACAF Nations League qualifying play. The qualifying round decided which of the three tiers — League A, B and C — that teams will enter in the CONCACAF Nations League. Wednesday's draw, held in Las Vegas, divided each tier into groups. For the purposes of the draw, teams in each of the three leagues were divided into pots depending on their CONCACAF ranking in November 2018. That left Canada in Pot 2 of the League A draw, knowing it would face one of either the U.S., Mexico, Honduras or Costa Rica in its group. Mexico is the top-ranked CONCACAF team in the FIFA rankings at No. 17, compared to No. 25 for the U.S., No. 37 for Costa Rica and No. 63 for Honduras. Canada is currently ranked No. 79 while Cuba is No. 174. The top six in qualifying automatically slotted into League A, along with Costa Rica, Honduras, Mexico, Panama, Trinidad and Tobago, and the U.S., which skipped the preliminary round by virtue of having qualified for the hexagonal round of CONCACAF World Cup qualifying for the 2018 World Cup in Russia. The Canadian men, who will play in Group A, wrapped up their perfect four-game qualifying round with a 4-1 win over French Guiana on Sunday in Vancouver. Group B is made up of Mexico, Panama and Bermuda while Group C consists of Honduras, Trinidad & Tobago, and Martinique. Group D consists of Costa Rica, Haiti, Curacao. "We have opened the doors of CONCACAF and its football to all," CONCACAF president Victor Montagliani, a Vancouver native, said in talking up the Nations League. He said the competition will raise the bar for CONCACAF soccer by providing meaningful matches for all. "We will look to book all eight available (CONCACAF) spots for FIFA World Cup 2026," he said, citing the World Cup to be co-hosted by Canada, Mexico and the U.S.
League A of the Nations League consists of four pools of three with the winner of each group advancing to the tournament semifinals. The bottom team in each pool will be relegated to League B for the next edition of the tournament. League B has four groups of four teams. The group winners will be promoted to League A while the bottom team in each pool will go down to League C.
League C is made up of three groups of three teams and one group of four. The group winners will be promoted to League B.
Guatemala, which did not participate in qualifying due to a FIFA suspension, was placed into League C. Guatemala is currently ranked eighth in the region (and 149th in the world). Canadian Soccer Association president Steven Reed and general secretary Peter Montopoli represented Canada at the draw. Canadian midfielder Alphonso Davies and forward Jonathan David, meanwhile, have been named to the team of the tournament for the qualifying round. Group A: U.S., Canada, Cuba. Group B: Mexico, Panama, Bermuda. Group C: Honduras, Trinidad & Tobago, Martinique. Group D: Costa Rica, Haiti, Curacao. Group A: French Guiana, St. Kitts & Nevis, Belize, Grenada. Group B: El Salvador, Dominican Republic, St. Lucia, Montserrat. Group C: Jamaica, Guyana, Antigua & Barbuda, Aruba. Group D: Nicaragua, Suriname, St. Vincent and the Grenadines, Dominica. Group A: Barbados, Cayman Islands, Saint-Martin, U.S. Virgin Islands. Group B: Bonaire, Bahamas, British Virgin Islands. Group C: Guatemala, Puerto Rico, Anguilla. Group D: Guadeloupe, Turks and Caicos, Sint Maarten.